Tranquility is the key word for Coorg – not so big place in Southern Karnataka People who visited Scotland in UK found similarity with this place and started referring this place as the Scotland of India. Tourists from all over India and abroad visit this place throughout the year to enjoy the natural beauty, mountains, flora and fauna of Coorg. The place is surrounded by mountains and forests. Here the River Cauvery is originated from the Brahmgiri hills of Tal Cauvery in Coorg. The bordering districts of Coorg are Dakshina Kannada to the northwest, Kasargod of Kerela to the west Hassan to the north, Mysore to the east, Kannur of Kerela to the southwest and Wayanad of Kerela to the south. Coorg is one of the world's largest coffee producing place. Also, it is India's main supplier of spices – Cardamom, Cinnamon, and Clove, Black pepper, star anise and many other varieties of spices. The other Coorg products include Rice, Timber. 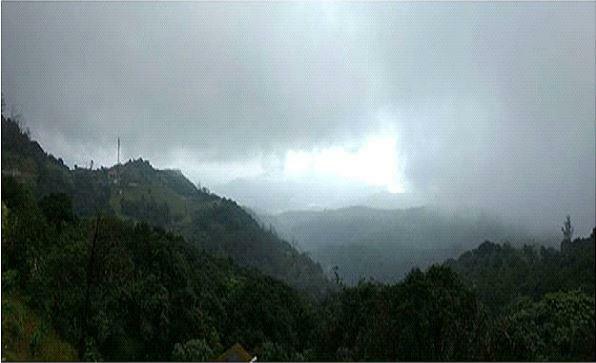 Madikeri is the headquarter of Coorg district. It is the land of ethnic warrior people Kodavas. Konkani is the main language spoken in this region. While planning a visit to Bangalore where some of my relatives and friends are permanently settled, I invited Debraj my son in law and daughter Tanushree to join with us in the group. Debraj agreed and insisted that we keep Coorg in our visit program. During last week of September 2016, we set out to Bangalore by the flight that departs in the early morning from Delhi. Our group of six included me, my wife, our elder daughter and grandson, Debraj and his wife, my younger daughter. Our flight reached on time and we were picked up by our cab booked earlier from Delhi. Though we were expecting a Suv like Innova but the transporter instead sent a Traveler Tempo 16 seater vehicle for our pickup. After about one and half hour we reached our brother's house in south Bangalore. We were greeted by our brother and his wife who were waiting at the entrance gate on the road. After freshening up we enjoyed cups of tea with snacks followed by breakfast. Had our lunch and went straight to bed for some rest. Our next day's program was to visit our other relatives in the town and we completed the visit program scrupulously. After returning back to our home at Bangalore we contacted Ola Cabs operator and negotiated with him our journey to Coorg at Rs. 11/- per kilometer. At about 6.30 AM morning the driver Prasantha came with his Innova. After loading our luggage we set out for Coorg at 7.30AM. Bangalore has become very congested these days and traffic even at this hour of time was too much. Our Driver followed a longer route till we were on the highway of Mysore- Bangalore Road. It was a continuous non-stop drive till we reached Mandya on our way, an agricultural town. At Mandya we stopped at a café for a cup of coffee and snacks. Spending half an hour we again resume our journey to Coorg. At about 2 PM we entered Madikeri. The district headquarters of Coorg, Madikeri is called the Kashmir of South India, one of the best places to visit in Coorg. A serene and pollution free hill station with an environment of eternal peace and tranquility is the main attraction for tourists to visit this place. At about 2.30 PM when we were almost near our place of stay about 10 kilometers away from Coorg, our driver insisted that we visit the famous Buddha Temple at Bylakuppe, a village on our way so as to manage our travel program judiciously avoiding coming back to this place again. 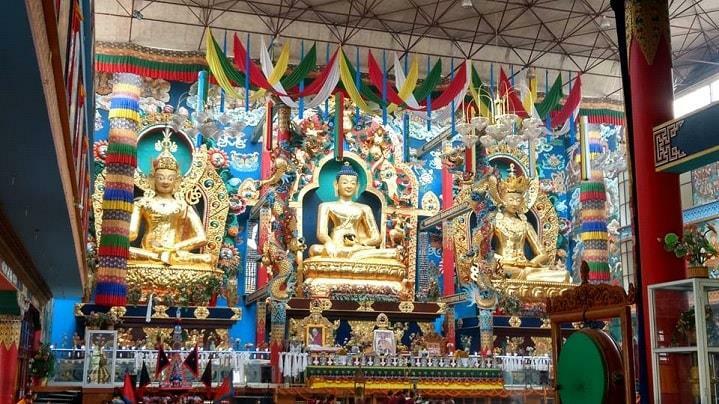 We entered the famous Namdroling Monastery at Bylakuppe another famous place to visit in Coorg, the biggest Tibetan settlement of south India. The flower garden with eye-catching hybridized different colored beautiful blooming roses welcomed us. At the entrance we were greeted by a Tibetan Monk. About a hundred students were learning their lessons inside the monastery Hall in front of statues of Buddha and his disciples. Sounding of drumbeats and chanting of hymns made the atmosphere heavenly. Here we bought some handicrafts and famous Tibetan Momos. As we were getting late for our Homestay accommodation at Coorg where Mr. Shanu, the owner was eagerly looking for our arrival, we decided to leave the place without wasting much time. After about 30 minutes drive we reached our Homestay. It was a double story house with beautiful lawn and garden spread over a few acres of land in a coffee estate. 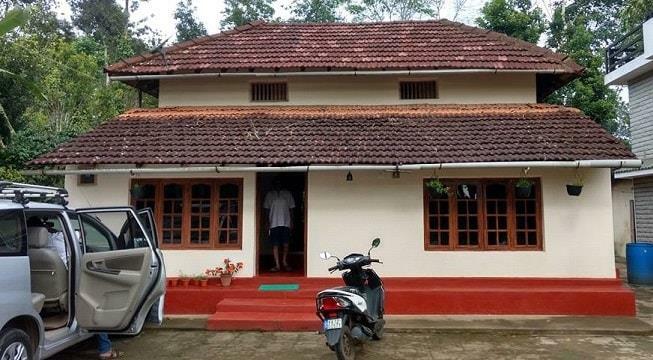 The Coorg's Homestays are becoming increasingly popular amongst tourists these days because of easy availability and reasonable rates. They provide very good complimentary breakfast, homely lunch and dinner at very cheap prices. After having our lunch we retired to bed and had a good afternoon sleep till we were woken up by the owner and behind him with coffee tray was one of his staff. We enjoyed our coffee and spent the evening in discussing our next day's program. In the night we finished our dinner and went to sleep early. At 10:30 AM in the morning we boarded our cab and traveled through serpentine roads miles after miles observing a number of coffee estates in the valleys in between beautiful mountains covered with clouds and greeneries. It was drizzling and the clouds were embracing and passing through us silently. 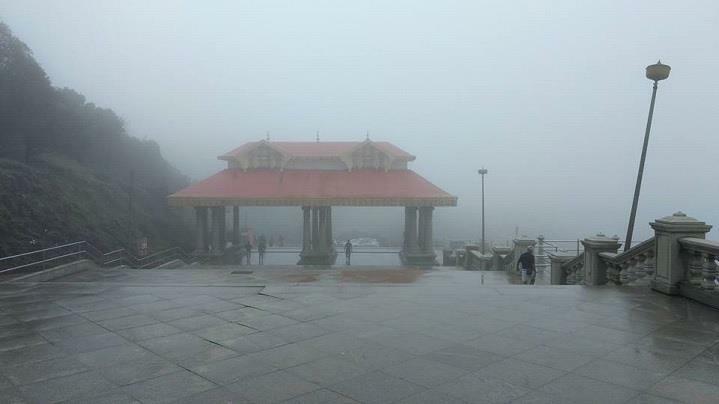 In about one hour's time we reached Bhagamandale, a famous historic temple of Coorg. Situated on the hills of Brahmgiri, the underground originating place of the river Cauvery, a temple of Ma Cauvery near an artificial pond constructed is worth seeing. People perform Puja at this site to please the souls of their beloved who are no more in this world. The sound unseen waterfalls falling at a very fast speed made the place mystique and heavenly. After spending half an hour observing the cloudy mountains we filled our hearts with joy and left the place for another destination Abbey Falls. On our way back we stopped at a roadside coffee pub and spent some time enjoying cups of hot coffee. further down to Cauvery River thereafter. An old hanging bridge with a no entry signage was seen in front of the stream. The place was crowded with tourists. We spent half an hour's time standing in front of the waterfall in a tranquil environment listening to the sound of waterfall with chirping of birds off and on in the nearby forest. Since evening was approaching fast, we started back for our Homestays. We felt like eating something and asked our driver to take us to some nearby restaurants. After about half an hour's drive we reached Coorg city and entered one of the cheap and best restaurants of the city.Ordered some dosa, vada sambar and sweets. After finishing the stuff we went for shopping in the adjacent big hall and bought some artifacts, mementos and food items. People of Coorg believed that Kodavas or Coorgis are descendants of Alexander the Great. Most of the people here are non-vegetarian. The dishes worth mentioning are Pandi Curry, Kadubu Baimbale and Atti Payasa. Each of their non-veg dishes are cooked with scented spices, coconuts and curry leaves. Our Homestay owner served many such dishes during our two days stay in his guesthouse. Coorg has many other sightseeing places like Onkareswar temple, Dubare Elephant Camp, Nisargadhama,Tal Cauvery Wildlife Sanctuary, Angling ( Fishing Centers ) etc. Since ours was a weekend tour we left for Bangalore next day morning and arrived our home at Bangalore in the evening.